Which U.S. States Have the Lowest Income Taxes? Another U.S. tax deadline has passed, and you may be wondering how green the grass is on the other side of the state border. 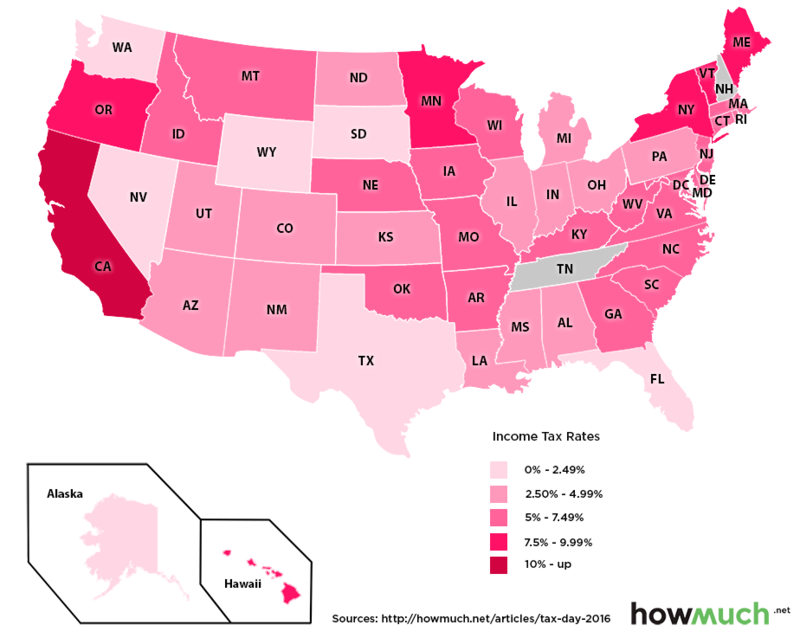 Today’s maps and charts, from cost information website HowMuch.net, show the difference in tax rates between states to help you discover which states pay the lowest income taxes. Before we dive in to the data, it is worth noting that there are seven states that currently have zero interest tax, including Florida, Nevada, Texas, Alaska, South Dakota, Washington State and Wyoming. New Hampshire and Tennessee also have no income tax, but they do tax interest and dividends. California has the highest average tax of any state at 10.4%. Oregon, Minnesota, Hawaii, DC, New York, Vermont, and Maine also have average state income taxes that are higher than 7.5%. Aside from the states with zero income tax, there are also 14 that have average tax rates below 5%. However, as HowMuch.net notes, the average isn’t necessarily the best indicator when it comes to this data. Since most tax schemes are progressive, the tax rates of most states vary heavily depending on the level of personal income each year. The top 25% of earners ($74,955 per year and up) pay the most in Oregon, which has a tax rate of 7.4%. Three other states charge 6% or more: Hawaii (6.89%), Idaho (6.05%) and Maine (6.00%). California now charges the most at 11.54%, while Oregon, Minnesota, and Hawaii all have rates hovering around 10%. How Financially Literate Are You With Investing?